Haven't you always wanted to know the right way to build a fire pit? 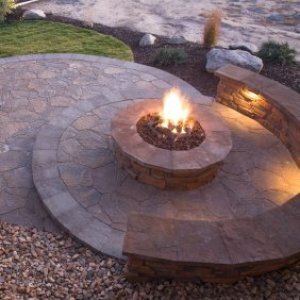 Backyard fire pits are a nice feature to add to your garden and are a necessity for campfires in the wild.This guide is about building a fire pit. When builiding a fire pit, you need to make it safe first. I dug down 3 feet, to make sure that I would not have any plant material, roots, etc. below my fire pit. I then filled it in with gravel and sand. My camp fire pit is over 3 feet wide so I made sure the hole was 1 foot on each side. Gravel is cheap, labor is free and replacing camp and the woods would be neither. We also cook on this so I have a surround that fits my grill grates and the cast iron griddle (it's huge, 31 pounds). The one at home is round vs rectangular. It's only fire so far until I can figure out how to make a circle frame for cooking. For the round one, I used two different kinds/brands of the cement block that curves. I have 3 rows. The one in camp, I use the concrete blocks that are filled with sand and gravel topped with solid 8x16 pavers (otherwise they fill with water, freeze, and crack. Never use fridge grates on firepits as they outgas. Wish you would of posted a picture. Would of loved to had a visual!